Home » author branding , book marketing , books , free event for writers , free webinars , free writers conference , Jo Linsdell , online writers conference , pitch sessions , promo day , Promo Day 2016 , publishing » Are you ready for #PromoDay2016? Only One Day To Go! Are you ready for #PromoDay2016? Only One Day To Go! Promo Day 2016 is just one day away! Tomorrow you'll be able to throw yourself into this information packed day of fun. 11 free webinars will be available all day long. Learn about a variety of topics related to author branding, book marketing, and editing. The presenters will be dropping by the forums throughout the day to answer your questions. 9 Publishers will be taking pitches during the Promo Day 2016 event and will reply to all pitches received by the end of the day. No waiting ages to find out if they're interested or not. Numerous genres accepted. There will be several LIVE video panel discussions during the event where industry experts will share tips, strategies, and tricks of the trade on a variety of topics. There will be several live events on different social media platforms during the day so that attendees can put into practice things they learn in the webinars and panel discussions. The perfect opportunities to network with others from the industry and discuss topics related to book marketing, and author branding. There will also be shout of sessions where you can promote your books. There will be plenty of opportunities to connect in the forums, but you can also network via your preferred social media channel. 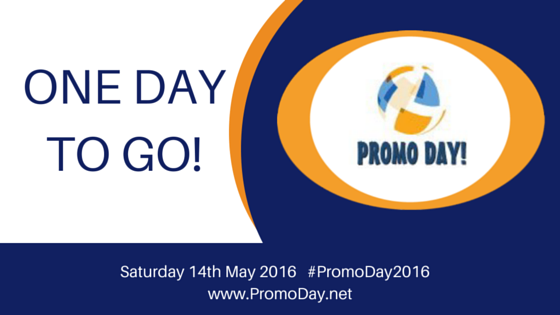 The official hashtag for the event is #PromoDay2016. Use it on your tweets and posts to connect further during the event.